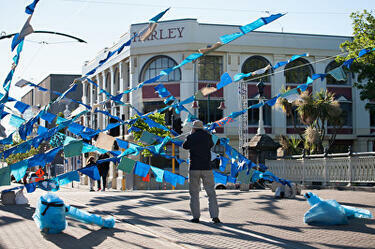 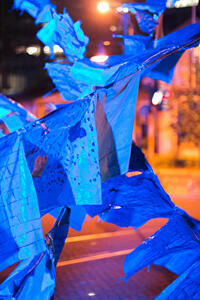 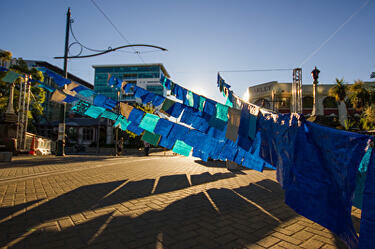 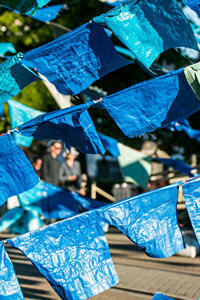 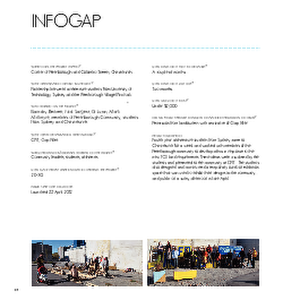 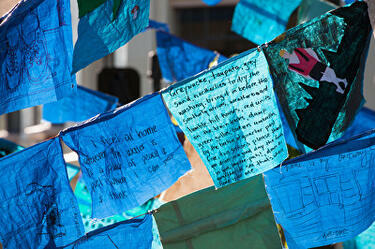 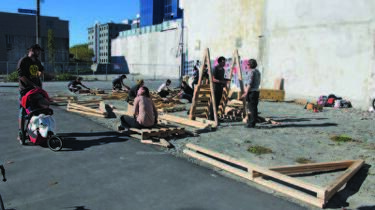 A photograph of part of the display structure for the Info Gap temporary outdoor display space. 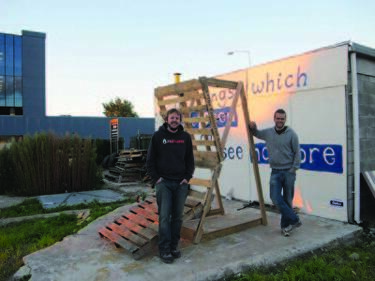 The structure is sitting behind the Gap Filler headquarters in Sydenham. 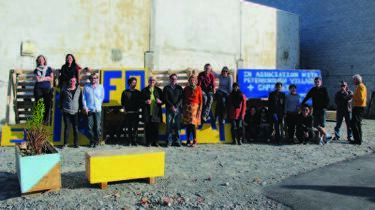 A photograph of volunteers at the Info Gap temporary outdoor display space on the corner of Peterborough and Colombo Streets. 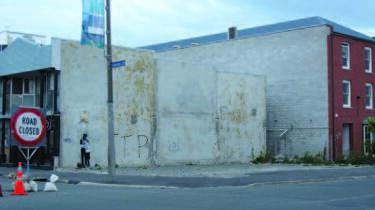 A photograph of the empty site on the corner of Peterborough and Colombo Streets where the Info Gap temporary outdoor display space will be constructed. 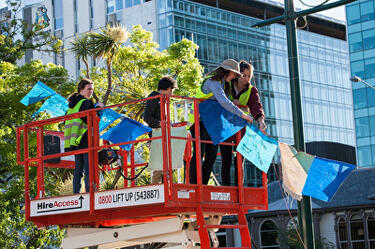 A photograph of volunteers constructing the Info Gap temporary outdoor display space on the corner of Peterborough and Colombo Streets. 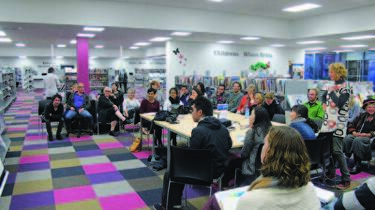 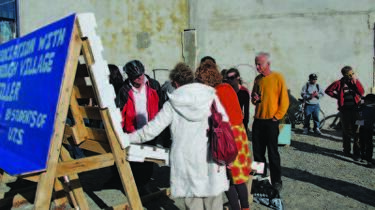 A photograph of people looking at displays in the Info Gap temporary outdoor display space on the corner of Peterborough and Colombo Streets. 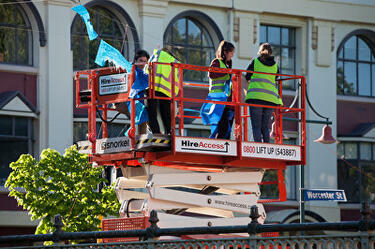 A photograph of four people on a cherry picker, installing strings of tarpaulin flags above the tram lines on Worcester Street bridge. 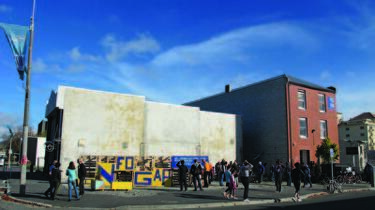 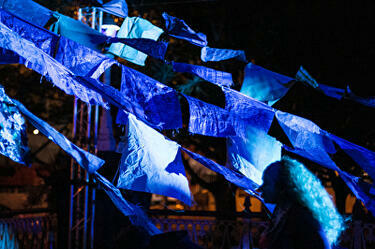 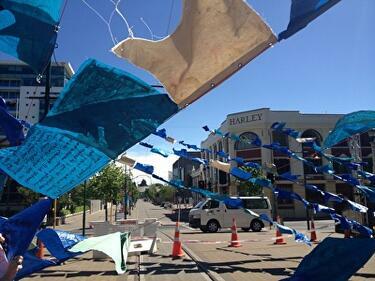 The installation was titled Eye of the Storm and was created by students from the School of Design at the University of Technology Sydney for Canterbury Tales - a carnivalesque procession which was the main event of FESTA 2013. 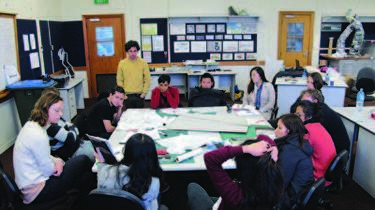 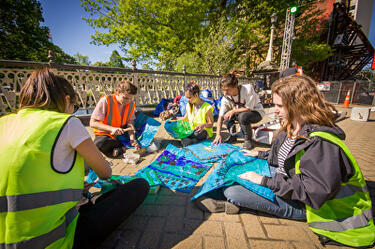 A photograph of students from the School of Design at the University of Technology Sydney constructing Eye of the Storm out of blue tarpaulin flags. 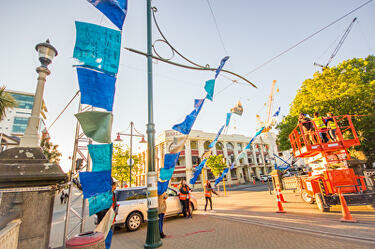 The flags were strung across Worcester Street bridge for Canterbury Tales - a carnivalesque procession which was the main event of FESTA 2013.